ACCEPTA 2326 is a easy to handle liquid sulphite solution that can be used as both a powerful oxygen scavenger for low and medium pressure steam boilers and also a neutraliser for removing chlorine and other biocides to protect sensitive systems such as RO plants or prior to discharge to the environment. ACCEPTA 2326 is an effective neutraliser of halogens, particularly chlorine, and a wide range of other biocides. It can be used to neutralise excess chlorine following disinfection of water systems, including cooling water systems and the feed to RO systems. 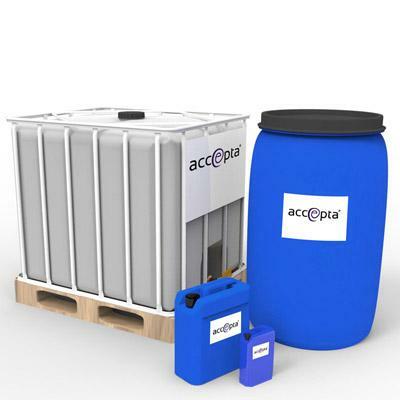 ACCEPTA 2326 can also be used to prepare waste streams for disposal to treatment services, including public utility services, by conditioning residual biocide including, but not limited to, C/MIT, DBNPA and THPS. Rapid reaction with oxygen ensures efficient protection of feedlines and boilers from corrosion. ACCEPTA 2326 is intended for those applications such as the food industry where heavy metal catalysts cannot be used. ACCEPTA 2326 reacts with oxygen to form bi-products which have no adverse effect on boiler integrity. One of these bi-products enhances protection against caustic embrittlement. ACCEPTA 2326 should be dosed at the rate of 18ml/m3 for every ppm of dissolved oxygen. A reserve of approximately 50ppm of sulphite should be maintained in the boiler water.